Atomos are an australian company based in Melbourne. The two founders, Jeromy Young and Ian Overliese, have been manufacturing and selling video equipment for the Graphics, Events, Broadcast and Film industries for the past 11 and 15 years respectively, for companies that include Canopus & Blackmagic Design. Jeromy and Ian believe that by using the latest technology in Atomos products, they can help video businesses by improving video production workflows. Everyone at Atomos is proud to have gained Apple's approval for their hardware implementation of Apple’s professional editing codec, ProRes. The Ninja2 is a battery-powered portable touchscreen recording & playback device, encoding video in real-time to the visually-lossless Apple ProRes format, onto low-cost, removable 2.5" hard disks, with a capacity of up to 16 hours on a standard 750GB drive (in ProRes LT mode). It combines the functions of Professional 10bit HD Recorder, Monitor, & Playback device, capturing pristine video and audio, in SD or HD, direct from any camera with a clean uncompressed HDMI output, storing it in either of the LT, 422 or HQ ProRes modes, or as Avid DNX-HD files. Audio input can be from the embedded HDMI stream, or via a stereo analogue input, with level control, stored on disk in 48KHz 16bit uncompressed format. The Ninja consumes very little power, and is designed from the ground up to be a low power device to ensure long recording times and efficient use of batteries. 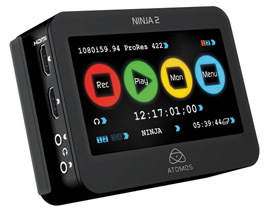 Atomos' unique battery-looping technology means that you never have to interrupt a Ninja recording to swap power cells. Just unplug the old battery and replace it with a fully charged one. Continuous Power! Most standard 2.5" hard drives can be used, which helps keep the running costs down. SSDs can be used, especially when "shooting on the run", but are not essential when the camera's more static. The Ninja is sold as a kit including battery, charger, docking adaptor & two disk caddy shells (disk drives are extra - ask for prices). Ninja makes it easy to get video off your camera and onto your computer. Insert the 2.5" disks into a docking station, or connect the device itself via USB, and the Apple ProRes files are recognised within seconds. They work natively with Final Cut Pro and on any computer with the ProRes codec installed (including suitably configured PCs - eg with Adobe CS5/6). 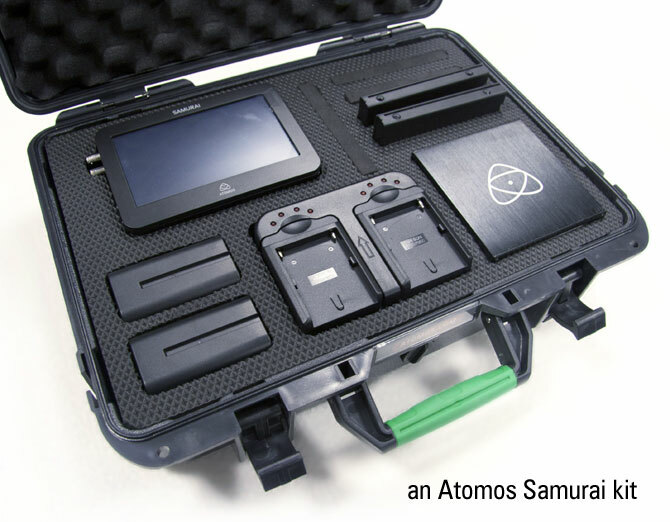 That's right: there's no capture card necessary in the Atomos Ninja workflow! 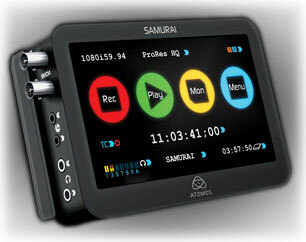 The next step up from Ninja, and slightly larger, the Samurai has SDI/HDSDI input and output. It has a super high-resolution 5" touch-screen monitor with an ideal workflow, from sensor to timeline in unparalleled Apple ProRes quality. All the innovative features of the Ninja plus time-code and gen-lock and the ability to work with multiple synchronised units. Samurai is simple to use as well, with a no-nonsense, intuitive touch-screen that doubles as a viewfinder and playback monitor. Samurai eliminates the need for a separate monitor, external high quality recorder and large battery by combining these three pro-video essentials in into one clever portable device. Connect Converters are the ultimate battery powered, in-the-field converter tool for any situation. With SDI and HDMI connectivity, internal and external battery options and Atomos’ patent pending Continuous Power technology, you can connect & forget about conversion anytime, anywhere. They’re able to convert any SDI or HDMI signal, including 3G. 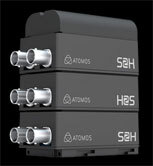 Choose S2H for HD-SDI>HDMI and H2S for HDMI>HD-SDI. Built for converting convenience, they are lightweight and fit in your pocket. Easily powered from battery or AC, they provide 3:2 pull-down removal, test pattern and audio signal generation, and even have a built-in torch for use in dark locations. They’re stackable and modular and you can cascade and power them from one source. Ideal for mounting on the back of a Ninja or Samurai to enhance the I/O capabilities. In the last 2 years Martin has been one of the trainers at the IOV Videoskills Roadshows, aimed at helping videographers improve their basic skills. Topics covered include lighting, sound, camerawork and editing, with a two-handed interview as the sample subject matter. This is the resulting video from the event at Gilwell Park, where the guest interviewee was Robbie Fleming from Atomos, who talked about the Ninja & Samurai portable 10bit ProRes recorders. Shot on a Sony EX3 and edited in Premiere CS5. Lit with Kinoflo Diva 400 and Dedolights, and recorded through a 416 boom mic, via a SQN4 mixer to the EX3. Educational pricing is available for some Atomos products for orders from educational institutions - apply for details. Copyright © 2018 Zen Computer Services.